WAIST HIGH: Happy 25th Birthday "Don't You Want Me." Happy 25th Birthday "Don't You Want Me." 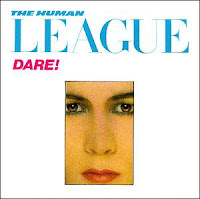 It was 25 years ago this month that "Don't You Want Me," the fourth and final single from The Human League's third album Dare, reached #1 in the US. In 2000, Q magazine placed Dare at number 69 in its list of the 100 Greatest British Albums Ever. It was also ranked 100th in a survey held by British television's Channel 4 to determine the 100 greatest albums of all time. "Don't You Want Me" is the 25th most successful single of all time in the UK. The other three singles from Dare include "The Sound of the Crowd," "Open Your Heart," and Waist High favorite "Love Action (I Believe in Love)." "This landmark album represents the very nucleus of electronic music that many would copy and it's relevance today cannot be under estimated."